Huh? What Is That Your Rose Just Said? My garden sighs longingly with a heavy yearning that murmurs quietly up stems of faithfulness held straight and true by deep-rooted perseverance, and eases into tightly folded, pent-up buds. From there it throws itself upon the windy strains of gossip floating amidst ivory magnolias (perseverance), nodding camellia (longing) and fragrant lemons blossoms (fidelity). No, I have not been reading too many fortune cookies with rolled up paper slips foretelling my future! I’m learning about Victorian gardens and culture, which was so modest and restrained that emotions were often communicated indirectly through symbolism, such as the “language of flowers”. Messages were encoded by choosing certain flowers to compose a bouquet. Yet strangely, when I apply this language to the flowers in my garden, it tells a fairly accurate tale. I do having longing, faithfulness and perseverance. I long to bring several creative visions to fruition, a desire supported by deep roots of perseverance and devotion to my dreams, beliefs, ethics, family and friends. So it might just be fun to see what the flowers and herbs you’ve chosen for your garden mean! Are they warning of deceitful danger nearby? Proclaiming an exuberant “welcome“? A “decoder” list of their Victorian meanings resides at Wikipedia: Language of Flowers. At least it could save you from mistakenly sending a bouquet claiming undying love. Conversely, if you do want to send one this Valentine’s day, you’ll know how! How to Garden With Impact in Small Spaces. If you live in an apartment, patio home, city environment, or just need a small-space garden, window box gardening is for you! Although there is no “right” or “wrong”, here are some ideas to help jump-start your creativity. Each element in a small-space garden counts. 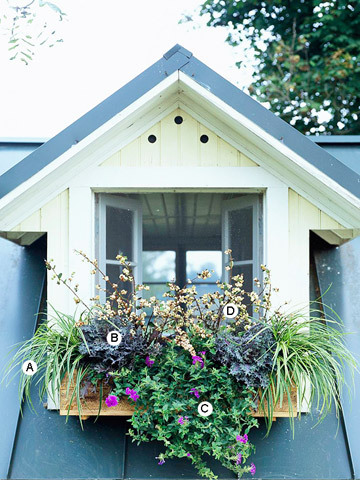 Consider the texture, color and style of each part, how the elements will relate to each other, and how the planted window box will relate to its surroundings. The type of window box you choose will set the overall tone, and they come in a huge variety of colors, materials and styles. Will your windowbox plantings reflect a modern, minimalist aesthetic, showcase a single color and type of flower, or perhaps tumble abundantly over the side? No matter which style you choose, a smaller space cannot carry an overgrown look well and will benefit from frequent trimmings and dead heading to keep it looking tidy and well-edited. Add height to your window box plantings. Unless you are aiming for a very modern or streamlined look, add interest with three levels of height. You can accomplish this with differently sized plants, adding a small trellis, or incorporating other garden accessories such as statuary. Choosing one central tall plant, or three tall plants, is a good way to begin differentiating your design into three “height layers”. If you prefer an unfussy look, choose a contemporary window box. Use only two colors in your plantings: the green of the stems and leaves, and the flower color of your choice. You can use more than one type of flower as long as they are all the same color. For a very modern flair, use only one type of flower in one color. Or just use green plants with interesting textures, without any flowers. Anything that trails over the side should have a very clean line. Window box gardens are as beautifully unique as the people who plant them. Viva la difference, and enjoy!